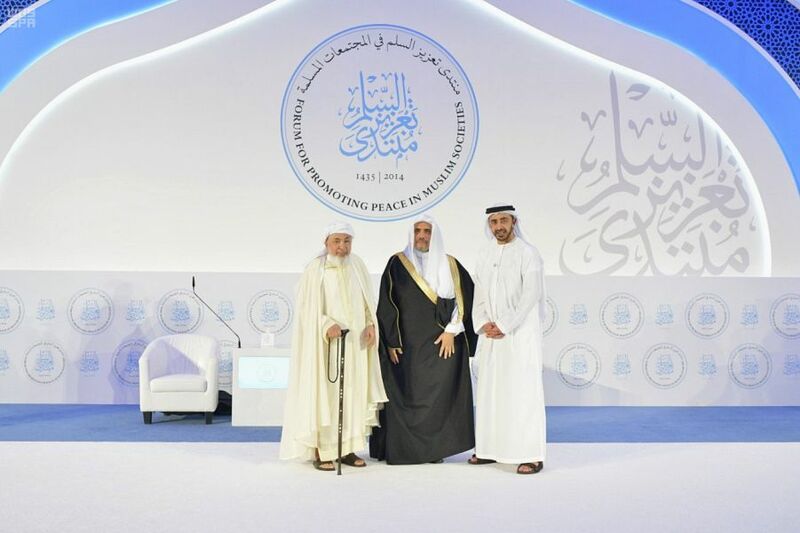 During the opening of the forum of reinforcing peace in Abu Dhabi, the Secretary General of Muslim World League, Sheikh Dr. Muhammad bin Abdulkarim Al-Issa confirmed that difference and diversity are of human beings’ nature. 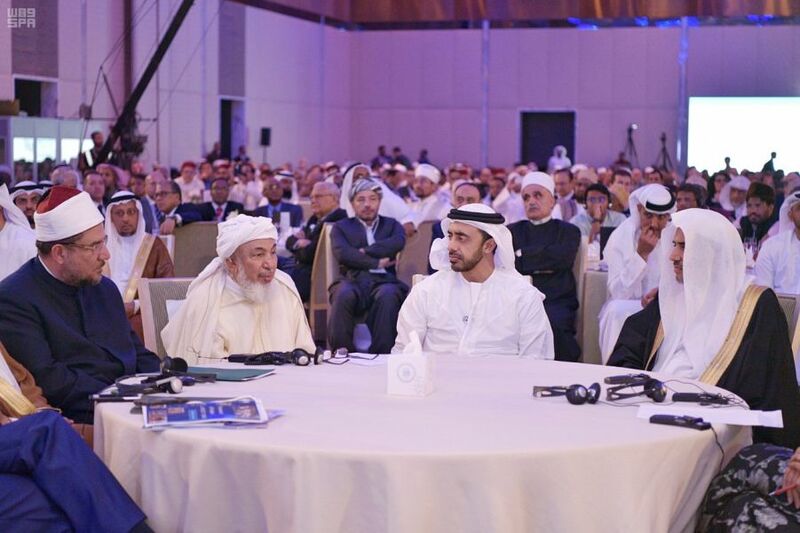 The conference was held under the title “Hilf al-Fudul; chance to enhance global peace” and attended by 800 representatives of religions and human rights organizations. 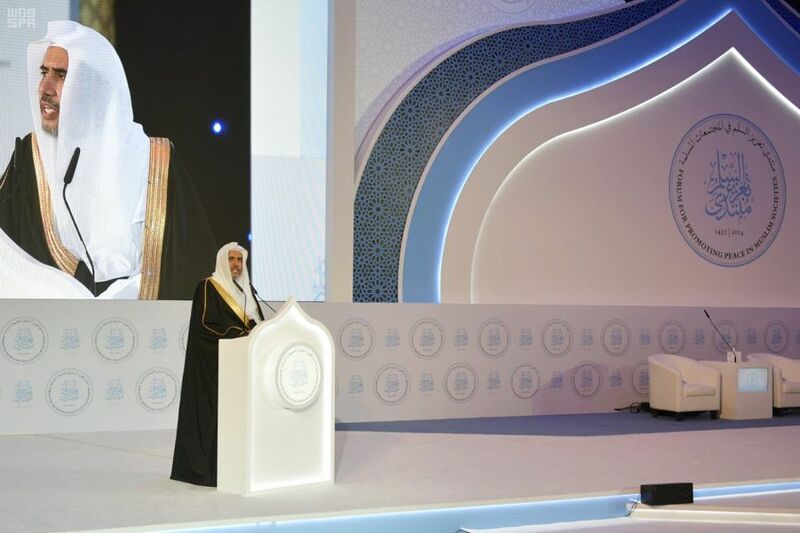 Al-Issa made clear that the Islamic values that preserved all legitimate rights and freedoms of others were not a grant or gift from human, but a mercy from Allah to all communities for the purpose of spreading peace, prosperity and stability. These Islamic values came as one bloc not divided and they are well-fortified against any penetration. Dr. Al-Issa mentioned three serious errors some people commit when trying to understand some historical facts. First: those who commit absurd practices and acts of hatred and terrorism are only one responsible for their acts and violations. All religions are full of followers who commit violations and practices of hatred, while their religions are innocent of these violations and practices. Second: all international thinkers did not notice that Islamic religion preserved the legitimate rights and freedoms of people without exception to the extent that scholars and jurists of Islam confirmed that Allah upholds the just state and neglects the unjust one whatever its religion. Consequently, the criterion and principle of justice are applied to all. Third mistake is that opinions are circulated from time to time about the position of Islam of other religions. Those who believe that Islam came to uproot other religions are very wrong. Those wrong thinkers also provide examples that Islam spread with sword and they also cite some historical facts or the misinterpretations of the texts that are not complete. Prophet Mohamed’s life is full of positions of mercy and justice to all people. Allah says: “And if thy Lord willed, all who are in the earth would have believed together. Wouldst thou (Muhammad) compel men until they are believers?” the speech is directed to the Islamic nation. Dr. Al-Issa rejected what is circulated by some writers about Islam. They say that Islam denied the right of existence of some heavenly religions to live in peace. Al-Isaa pointed out that Islam understands the existence of all religions as an inevitable universal law and difference and diversity are of the nature of human beings. Dr. Al-Issa stressed that Islam’s preserving for the rights of minorities is a cornerstone of its justice and high values. Madinah’s Document that has recently been discussed in Marrakech Conference was the best example. Every jurist in Islam knows that any scene that goes beyond that natural context is justified by the law of war for everyone at that time. Allah says in the Holy Qur'an: “Among the People of the Scripture there is he who, if thou trust him with a weight of treasure, will return it to thee. And among them there is he who, if thou trust him with a piece of gold, will not return it to thee unless thou keep standing over him. That is because they say: We have no duty to the Gentiles. They speak a lie concerning Allah knowingly.” Dr. Al-Issa concluded his speech by stressing the impossibility of the emergence of an alliance of world peace until internal peace is achieved with the human self, individuals and societies.